Dr. Sean Martin graduated from the University Of Richmond. He majored in Sports Medicine. He received his D.M.D from the University Medical and Dental School of New Jersey. He completed his advanced training and General Dentistry Residency at Robert Wood Johnson University Hospital, and he is Invisalign certified. Dr. Martin returned to Ocean Family Dental from Chicago where he spent 3 years surgically training and placing over 500 implants. He is newly married and the father of a newborn son. 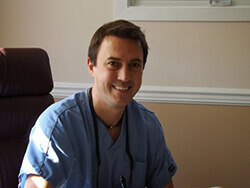 Dr. Martin is recognized as one of the BEST DENTIST in Ocean County as well.